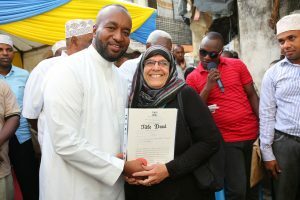 The establishment of the department Land, Housing and Physical Planning could not have come at the right time when the City of Mombasa has been grappling with critical issues of land tenure, housing and rapid urban growth. The department is charged with the mandate of overseeing land administration through policies that guide land usage in Mombasa. On Housing, the department is responsible for urban housing standards and provision of the mass housing plan. Likewise, in planning, the department ensures that every plan conforms to the laid down procedures and guidelines for urban development. The aspect of public participation has also made it easier for residents to take part in decision making and determine what is good for them and demand that it be implemented to improve the quality of their lives. The residents are able to prioritize the projects so that the solutions that come are derived from what the people have proposed and meet their needs. Mr. Edward Dzila Nyale, the County Executive Committee Member in charge of Land, Housing and Physical Planning exudes confidence at the plans that the department has developed and what has already been achieved. 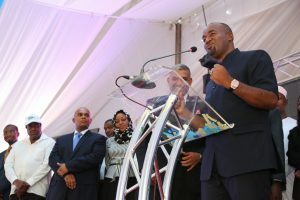 “For the first time, through the cooperation of the Japanese Government, we have been able to complete the great master plan for Mombasa which highlights areas of opportunities and areas of improvement in terms of infrastructure and urban development,” he disclosed. This, he adds, is the first time in 20 years that a master plan for the city of Mombasa has been developed and already an infrastructure development is fashioned to take into account the provisions of the plan. Some of the project envisaged in the plan is the Likoni Bridge which is in the final stages of designing, the second and third Nyali bridges and a light train from Likoni to Kengeleni to be completed between 2030 and 2040. A lot has happened and more is expected in the department. A new land policy, for instance, passed by the County Assembly in 2017 to deal with unique issues affecting the people of Mombasa, has enabled the County to come up with real solutions to deal with the chronic problem.. The land policy deals with unique issues such as tenant at will an issue that is only unique to Mombasa County. Financing remains one of the challenges that the County has to face. However, as part of the initiative to increase revenue streams, the department has just completed re-evaluation of the valuation roll 20 years after the last one was done for Mombasa. In 2016, the County Government launched its Vision 2035, a blue print unveiling a number of projects that will make Mombasa regain its position as a leading tourist, logistic and manufacturing hub. The department has in its plan, the establishment of special economic zones such as the Petro City in Pungu Likoni, the Eco City in Mwakirunge that will specifically change the way tourism is done by focusing on areas like conference tourism. The squatter problem is one that has been the biggest headache not only for Mombasa County but the entire Coast region. Mr. Nyale observes that the Waitiki case in Likoni is just a drop of the entire region concern on land. “All over the County, Kisauni, Jomvu, Likoni have issues like absentee landlords, tenants at will making the squatter issue a ticking time-bomb waiting to explode if not addressed. “As a County, we are creating our own fund towards the issue of resettling squatters. A law has already been passed to take care of this. We will allocate funds as a county but also looking at other sustainable ways of raising money,” adds the Executive. On short term measures, he says the department has undertaken mediation role between land owners and squatters to resolve land disputes. The County Government plans to settle at least 30, 000 squatters at a minimum in the next five years. Mombasa, like any other city has had to grapple with the problem of growing informal settlement which is a normal consequence of rapid urbanization. Mr. Nyale says there are 70,000 documented informal settlements in Mombasa, a situation calling for a multi-prong approach. The County Government has unveiled an ambitious Social housing plan that will put up low cost houses by ensuring that rentals are affordable and to move the people from the informal settlements to the new housing units. The plan is to build 32, 000 houses under the mass housing plan in the next two years. On the development of informal settlements, the County Government of Mombasa has partnered with World Band, Swedish Government and Kenyan Government through Kenya Informal Settlement Programme (KISP) to improve the conditions of the settlements. “Already four informal settlements among them Ziwa la Ngombe are on the pilot phase where we are paving roads, lighting, build model schools and have a land tenure that ensures that residents eventually have title deeds. “We have a master plan to ensure that informal settlements are properly planned ensuring accessibility, clean drinking water, security and other social amenities,’ Mr. Nyale said. Funding still remains a major challenge because projects of this magnitude such as the social infrastructure and resettling squatters require colossal amount of money. 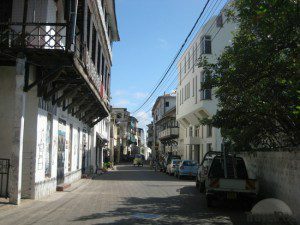 Equally challenging is the shrinking space for development given that Mombasa County is the smallest and short of land. One of the strategies that the department of Land, Housing and Physical Planning is using is to redevelop and change the zoning plans to allow for high rise buildings to maximize on space. “We are telling residents of Mombasa that great things are coming. The first five years were used for planning and now we have a clear focus on what we want to do to improve the quality of life for the people of Mombasa. “Mombasa is now establishing its foothold in terms of business and investment opportunities. Mombasa is ready for business,” assured Mr. Nyale.